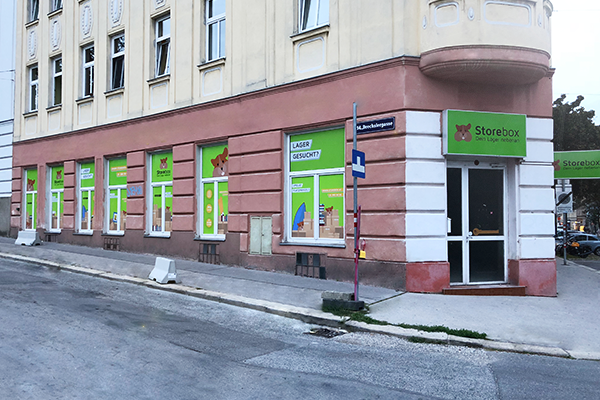 The Storebox Linzer Straße is situated in the Linzer Straße 54, 1140 Vienna. The selfstorage shop offers 244 m² of storage area and optimal accessibility around the clock. Book your compartment directly online in a non-bureaucratic way and store your stuff in right away! You will get your personal access code right after the booking, which allows you a 24/7 access. Smart sensors measure air temperature and humidity in real-time, you can access the data online in your dashboard. The Storebox is video-monitored and your belongings are insured up to 10,000 euros. Optional storage aids and moving service make the storage easy. The Storebox in 14th Viennese district Penzing is located in the Linzer Straße, not far away from the train stations Penzing and Breitensee. You can reach us by public transport (trams 10, 46, 49, 52, S-Bahn, regional trains) as well as by car via the Linzer Str. and Westautobahn A1. There are multiple parking lots in front of the Storebox for unloading your stuff. Please keep in mind, that 14th district is a short-term parking zone.